Situated in the lake county, (good fishing area) an hour from Dublin, this is the ideal spot to relax or use as a base to travel from. Golf is big, with 5 golf courses within half an hour travelling distance. The house, once a barn, is to the rear of an Old World Pub, in a quite village. Our restaurant open's Wed-Sat 12.30 -8.30pm & Sunday, 1-8pm. The house is decorated quite modernly and we will do our best to help you enjoy your holiday. We have just received a Bridgestone Award 'Best in Ireland 2017' so we are delighted with that. The house is in the family since sometime in the 1800's, and until about 60 years ago it was a bakery for the local townspeople. The picture is us, the family with Johnny Depp, he came for lunch in November 2013. This was major excitement for us and the national media also. He said he'll be back because he thoroughly enjoyed his lunch and the relaxed atmosphere. When you sample a little of our life and ways you will understand the attraction to our village and our house. Originally the house was a bakery but when we came to live here, the house was a store for the beers for the bar. It took three refurbishments to make it what it is today. It is cosy, yet spacious, and decorated in a contemporary style but has some of the features of the old building. The view out the back window is the yard and gardens. There are old stone barns with red painted doors. The house is at the back of the restaurant and bar, so you don't have to leave the property to get to bed after your dinner or spending time with the locals in the bar. The atmosphere in the bar is unpredictable in the sense that it might be quiet with just the turf fire to keep you company or there could be stories from one of the locals to entertain you. On Friday night (most weeks) there is music in the bar, where you are welcome to join in if you wish. It is a mix of sing-a-long, country, blues, pop and some Irish folk songs also. There are several golf clubs within a short drive from the house. The house is wheelchair accessible, but the bedroom and bathroom are upstairs. Making it not so suitable for wheelchair visitors. We enjoyed our stay with Una at her little cottage behind her pub. It was unfortunate that we did not get to meet with her but she had Ursula give us the rundown of the place. The locals at the pub were very helpful and friendly. We were missing our pup like crazy and Max was right their to provide "pet therapy". Lovely time and we would recommend anyone to stay and walk about the village. The Weir's place in Multyfarnham was the best part of our vacation! We were greeted daily by Max and all of his wiggly enthusiasm. Una and Pat checked on us as we passed by each day to make sure we had what we needed, and if we needed any guidance navigating the area. This rural village was quiet and calm, beautiful and friendly, and the home cooking and hospitality at Weir's Bar and Lounge were perfect! Una even helped to make special arrangements in nearby Mullingar when she learned we were looking for a special souvenir from the area. And don't miss Una's bread, it is so hearty and filling, a great way to start the day. Thank you to our hosts for providing everything we needed, including a comfortable bed in a very quiet setting for a great night's sleep. 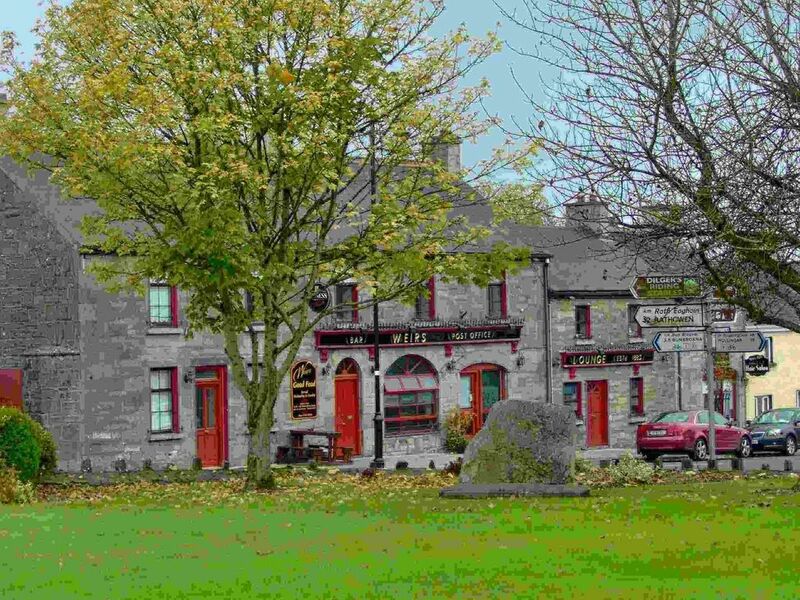 Excellent location & the accommodation was ideal for us as a couple to explore parts of Ireland we hadn’t already seen. Cottage is very well appointed & very cosy & comfortable. Has everything needed as a base home away from home. Hosts Pat & Una were gracious & helpful (even though Pat has not quite mastered the Aussie accent!). Having a pub just steps from our door was a bonus, with great food, excellent service & staff plus great fun conversation with the locals. We stayed in the 1 bedroom cottage but there is also a delightful 3 bedroom cottage as well. Cannot recommend this location & accommodation highly enough. Will definitely come back to Multyfarham if we return to Ireland. My wife and I enjoyed our week in Multyfarnham. The cottage had all the necessary comforts of home and it was the perfect place to make our base for short trips to the likes of Dublin and Galway. Una and Pat were wonderful hosts and the food and bar in the Pub were outstanding. Met many interesting locals over a pint or 2 and Pat's musical talents in the Pub on our last evening made for a memorable finish to our trip. My husband and I visit Multyfarnham on a fairly regular basis due to family connections. Una’s and Pat's accommodation is ideal for the two of us it has everything you would need for self catering, it is modern and clean and in a fabulous location. Una and Pat are extremely welcoming hosts and always go beyond the call of duty to make our stay enjoyable. We then spent a lovely evening in their friendly and welcoming bar, we will definitely be returning! Una and Pat were wonderful hosts! They were hospitable and caring in everything. They were knowledgeable in the surrounding areas of Ireland and helped us plan our days to make our trip stress-free. We certainly will recommend Weir's Pub and their beautiful cottage to anyone! Thank you! Multyfarnham is a quaint rural village, set in the lake county of Ireland. From Dublin heading west, you take the M4 west, then the N4 west. You pass the exits for Mullingar and you see Lough Owel on your left. A mile past there, you will see the sign post for Multyfarnham. There is a right hand turn, (at the Covert Pub), take it and keep left at the little round about. Less than 2 miles from there is Multyfarnham. When you enter the Village, Weirs Pub is in front of you. Our bordering counties are Meath, Cavan, Longford, Roscommon, Offaly and Kildare. The area is very scenic and has plenty to offer. In our village there is a Franscian Friary dating back to the 11th century, the oldest working Franscian Friary in the world. Wheather you want to relax or have historical interests, want to go fishing or golfing, this area is ideally situated. Dublin is an hour away, where you can shop till you drop, go to the theatre or visit the many attractions our Capital City has to offer.. Normally I ask for half of the total rental as a deposit, you pay the remainder of the booking when you arrive. if you have a special request or I have not given clear details, please email me to ask …..